The Filipino drinking I grew up with wasn’t of Tiki cocktails or tropical twists on classics. Instead, I remember the Coors and Jack Daniels that fueled family gatherings and hometown fiestas. But local blogger/cookbook author Marvin Gapultos opened my eyes to a part of the Filipino culture that was sadly absent from my upbringing: Filipino cocktails! Yes, there is such a thing. In his new book The Adobo Road Cookbook: A Filipino Food Journey — From Food Blog, to Food Truck, and Beyond he has a section dedicated to them, which follows the path of the American military’s introduction of cocktail bars and nightclubs to the Philippines in the 1900s and the first exotic cocktails’ appearance in a 1939 international cocktail book The Gentleman’s Companion. It’s a good primer on Filipinos’ contribution to the Tiki cocktail culture. One of the most famous L.A. Filipino bartenders, Ray Buhen, worked at iconic tiki bar Don the Beachcomber and was the first non-white bartender at The Luau’s front bar in Beverly Hills. He went on to open the beloved Los Feliz bar Tiki-Ti which is run today by his son and grandsons. Unfortunately, cut to now, and Filipino cocktails haven’t exactly caught on in Los Angeles like they have in New York. 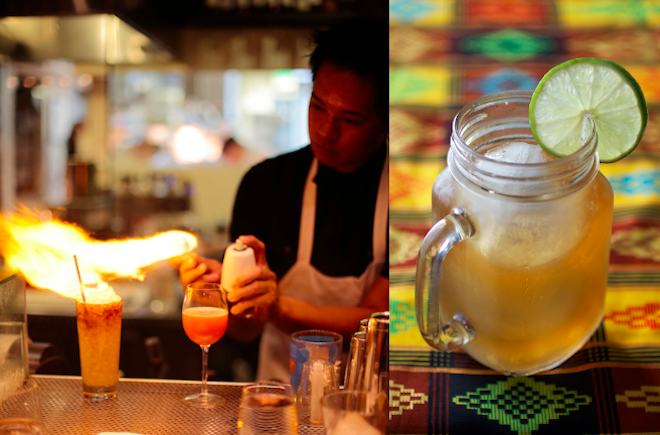 In the Big Apple, there are bar/restaurants that actually feature them, like Maharlika and Jeepney, and even the annual cocktail event Manhattan Cocktail Classic threw a Filipino Fiesta this year. No such love in L.A.
You’d think that with the frenzy that was generated by the now-defunct Filipino food truck Manila Machine (co-founded by Marvin and Let Me Eat Cake blogger Nastassia Johnson), interest would be reignited. But Filipino anything has never really gained traction here, other than as a form of extreme eating thanks to balut. I still have hope that bartenders around town may begin to draw attention to this much-overlooked aspect of Filipino culture. I’m looking to our few Filipino-American bartenders, like Devon Espinosa (Pour Vous) and Ken Baranda (1886, Jax Bar & Grill), for inspiration. Baranda occasionally features homeland-inspired cocktails on his menu at Jax in Pasadena, like the tiki-style “MacArthur’s Revenge” (great name), and he will be mixing some up tonight at bartender competition May Mix-Off in JW Marriott Los Angeles L.A. Live’s Mixing Room. But for hot summer nights at home, try out his boozy version of a favorite Filipino dessert, Halo Halo, which means “mix mix” in Tagalog. 1) Half fill and layer a Collins glass with the Halo Halo mixture. 2) Shake with an ice cube and strain first five ingredients over crushed ice and Halo Halo mixture. Optional, if you dare: Garnish with a hollowed-out calamansi shell filled with flaming overproof rum and a pineapple leaf. But blow out flame before drinking! 3) Enjoy with a spoon and straw. *Halo Halo mixture: Pinipig (or Rice Krispies), jack fruit, sweet red beans, sweet plantains, mango, shredded coconut (use the coconut from your milk mixture), ube ice cream (purple yam). Or, if you want to simplify, you can get a premade Halo Halo mixture at any Filipino store, like Bahay Natin in Palms. For something to enjoy with Filipino cuisine, Marvin’s favorite cocktail to drink with Sisig and spicy chicken wings (both recipes are available in his book) is his “Manila-Acapulco Grog.” “I like the Grog with Sisig — I like anything with Sisig—but I like that one because it comes in a tall glass and there’s a lot of it and it’s refreshing and cooling,” he said. 1) Combine all of the ingredients in a cocktail shaker filled with ice and shake vigorously until well chilled, about 30 seconds. 2) Strain into a large mug filled with fresh ice cubes. Garnish the drink with a lime wheel or a calamansi lime. 1) Cut each calamansi lime in half, and then squeeze the juice through a sieve and into a small container. Set aside the calamansi rinds. Discard the seeds in the sieve and save the calamansi juice for another use. 2) Place the reserved rinds, sugar, and water into a saucepan over high heat and bring to a boil while stirring frequently. Reduce the heat to low, and simmer for 10 minutes, stirring until the sugar dissolves. Remove from the heat, and then cover the pot and allow the syrup to cool completely to room temperature. 3) Pour the syrup through a fine mesh sieve set over a large bowl. Press down on the rinds in the sieve to extract as much liquid as possible. Discard the rinds. Store calamansi syrup in a lidded container and refrigerate for up to a month.